Once upon a time there was a little girl who liked loved receiving gifts. Whenever her favourite aunt used to visit, she would come with a bag full of gifts. Not only her aunt, most of her family believed in giving gifts and the little girl loved receiving them. Gifts for birthdays, gifts for Durga Pujo, gifts when someone visited them or gifts when someone went travelling and picked up a little souvenier. Then she started growing up and she started thinking if she loved receiving gifts, so must other people. It need not always be expensive stuff, sometimes just the simplest of things can bring a huge smile on people's faces. It is the thought which is the most precious. So this little girl embarked on a gift giving and receiving journey, loving every moment of it. She doesn't know what she enjoys the most-- the idea that a certain friend or a family member needs a gift, or the planning a suitable gift, or the smile that look of surprise when someone dear receives a gift, or the smile it brings to their face. Of course I am no longer a little girl, but my passion to think of a nice gift for someone close to me is still going strong. I just can't get those people who complain that buying gifts is a bother. It is never that for me, however busy or rushed I am. I simply refuse to see it as a chore. Maybe I should have chosen this as my profession, be a professional gift buyer. I am sure I would have excelled at my job. 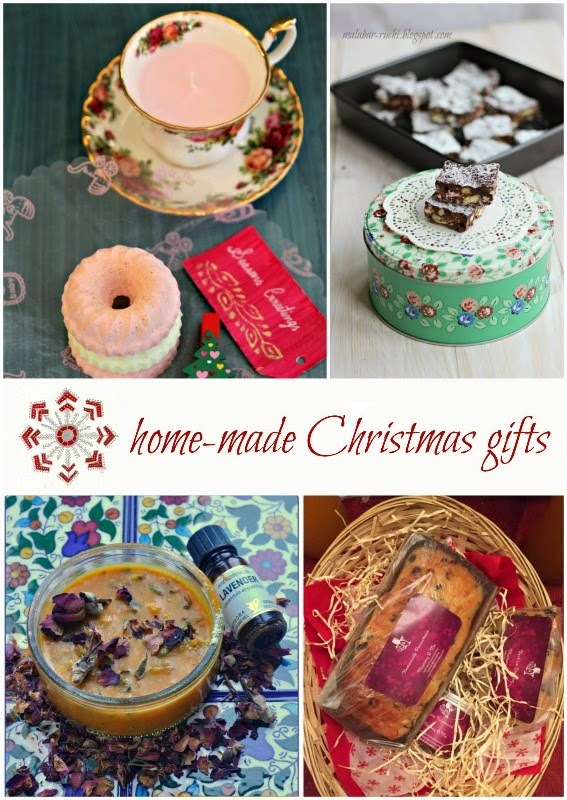 With a bunch of my food blogger friends, I have started a Christmas tradition of exchanging home-made gifts. Last year we all did edible gifts. So this year I wanted to spread my wings and make something non edible. I decided to make the girls a spa kit. I made home made body scrub and a lip balm. While I was finalising my gifts and designing a card, my husband asked me so what would the spouses and kids get? The question caught me unawares. These are indeed girly gifts. Then I decided to bake some cream cheese cookies with orange zest and include a bag of them in the goody bag. We decided to meet for brunch at a nice place and exchange our gifts. A proper girls day out. I don't remember when was the last time I was this excited. I was almost jumping with joy and smiling crazily at random strangers travelling on a foggy Sunday morning on the Northern Line. Even though we had little clues about what each one of us were making for the others, mostly it was a suspense this year. By the time we met, we were all carrying huge bags stuffed with gifts and we were simply dying of curiosity. So once our orders were placed and we were sipping our cocktails, we opened our gifts and there was a lot of ahhhhs and ohhhhs in our table. Each of us were thrilled with our gifts and the amount of planning and effort our friends had put into it. Might I add, we were really proud of each other's handiworks? Damn we could start an Etsy shop right there in the posh Christopher's American restaurant in Covent Garden. Gayathri of Mummy and Me went all out this year and created a fabulous Christmas hamper. In this hamper she included mulling syrup, a panettone, a stollen, garam masala flavoured salt and a box of home made chocolates with sea salt. Each of these items she had made on her own and painstakingly packed with cute labels. We were all floored with her gift. She has already blogged her mulling wine recipe. Nisha of My Kitchen Antics gave us scented candle in vintage English tea cups and three different flavours of bath fizz. Her gifts are so pretty, I am not sure I want to use them. The candle I am definitely keeping for a very special occasion. She has blogged both the gifts. Vineetha of Ruchi baked us rocky road bars which she then put in vintage tins. Now for the bunch of tin lovers that we are, she couldn't have chosen something more perfect. The tin you see in the photo above, I was lucky enough to get it. And since I have a matching thermos from Dotcomgiftshop, I am already planning my summer picnic with them! Vinee has already blogged her Rocky Road bar recipe. 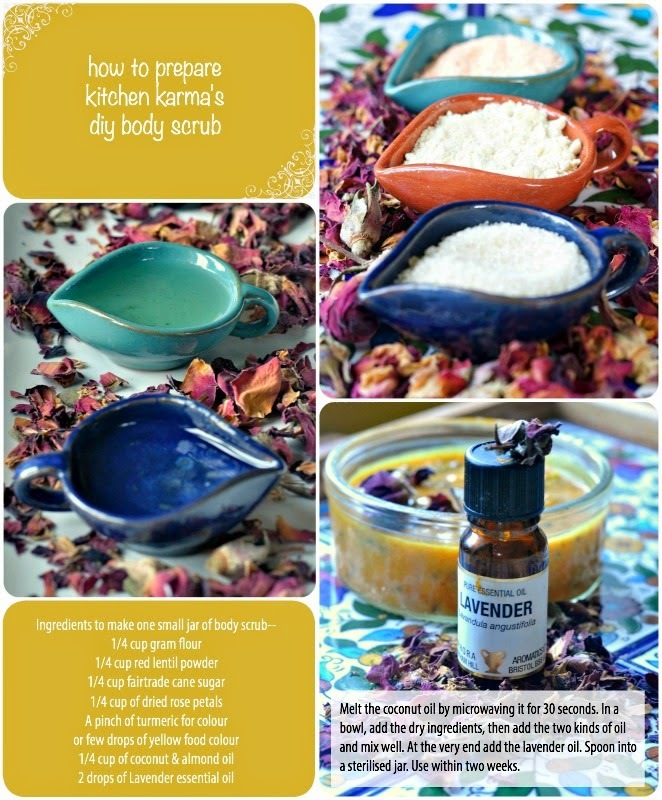 Today I want to share with you the recipe for the body scrub which I made for the girls. While researching for scrubs, I came across lots of recipes. Most of them are sugar based. Pinterest has a host of such pretty pictures. 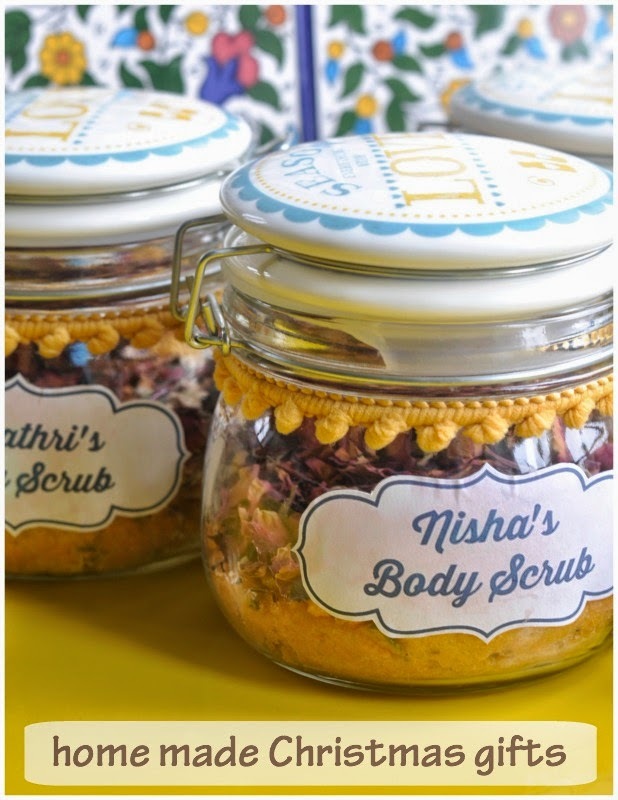 Looking at these recipes, I realised that growing up in India we often used home-made scrubs, specially if we had a party to attend or there was a social occassion. Of course in India the overwhelming reason women scrub their faces and bodies is to lighten the suntan. 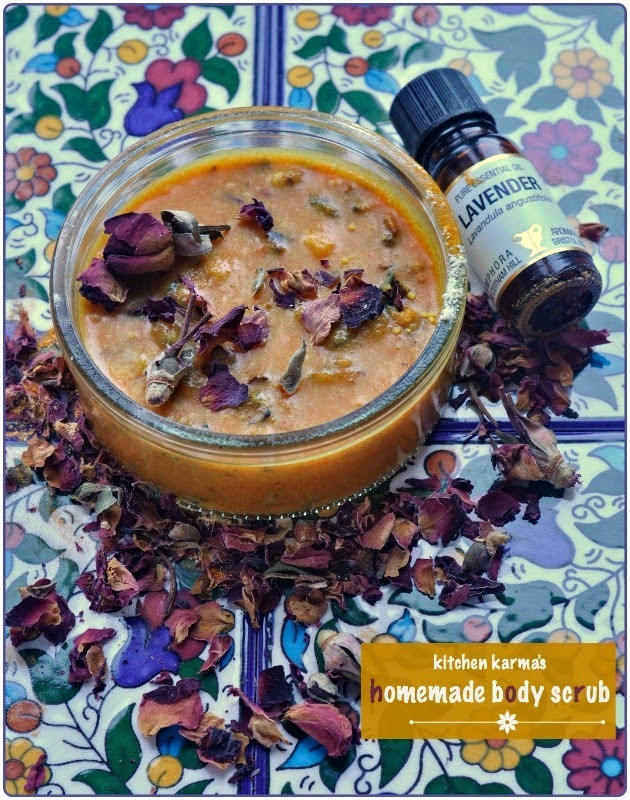 I decided to merge one of the Western recipes with some of my Indian ingredients and create a body scrub which is essentially my own recipe. Even with all this merging it is a simple, straight forward recipe. If you cook Indian food at home, chances are you already have the ingredients. If you ever got inspired to make onion bhaji and daal at home and have a packet of turmeric stashed in the shelves somewhere, you are sorted! Most of the ingredients I have used are edible. Except for the almond oil and lavender essential oil. It is a pretty forgiving recipe, you can chuck the red lentil powder and instead use double of gram flour, or just use one kind of oil or use another essential oil. But whatever recipe you do, please do a small patch test before using it on your body to check for reactions. I used it before giving it to my girl friends and also asked them to do a patch test. Melt the coconut oil for 30 seconds in the microwave. In a medium sized bowl, add the dry ingredients, then add the coconut and almond oil and mix well. At the very end add the lavender oil and spoon in a small jar which has been sterilised. Keep covered and use within two weeks. Apply a little of this mixture on your neck, shoulders, arms and feet and leave for 5 minutes. Wash it off with lukewarm water and do not use soap on your skin for the next couple of hours at least. This will remove the dead skin and leave your skin baby soft, moisturised and hydrated. Before using please do a small patch test to check for allergies or reactions. Once I finished packing the scrubs this is how the bottles looked. To personalise the gifts, I designed these quick labels on picmonkey and my husband the master paper cutter did the shapes for me. So now each of my friends had a personalised body scrub jar and to make the experience more indulgent I threw in some extra dried rose petals for them to use in their bath. What do you think of my gift idea? My girl friends are pretty pleased and so am I! In case you are looking for edible gifts try Vineetha's or Gayathri's or try what I did last year--Hot Chocolate in a Jar & Festive Biscotti to dunk in it. Or you could even try these easy to make marbled chocolate treats that I recently created inspired by a cooking class.